So here’s the thing…I never thought I’d end up fostering dogs. Much less, pit bulls. I’m not one of those people who’s been rescuing animals their entire lives. I didn’t bring injured bunny rabbits home and nurse them back to health in a shoe box. I grew up with dogs, and I cried when they ran away when I was five (Max), got hit by a car when I was ten (Ginger) and died of old age when I was away at college (Jessie). I love animals, especially dogs…But dog “rescue”? Nah, not me. I did know I always wanted a dog of my own. My husband, Dave, was on the same page. So when we finally bought our first home in the summer of 2009, we knew the time was right. We had a fence built that next spring and by April, Oscar had joined our family. I had no idea what that brindled face and deep brown eyes would do to my heart – for the second time in my life, I was deeply and completely in love. Oscar is a pit bull mix. Unfortunately, pit bull breeds have a nasty stigma surrounding them in this country, and especially here in the South. They’re assumed to be “fighters,” and labeled as “vicious,” “dangerous,” and “unpredictable.” Some people straight out hate them – having never even met one! Once we adopted Oscar and got to experience firsthand that goofy personality and eagerness to please his people that is so typical in pitties, I just could not understand the reputation. The more I met other pit bull owners and their dogs, the more it reinforced what I already knew – pit bulls can be AMAZING pets! Despite this, pit bulls are crowding the shelters and are some of the hardest to adopt out. Here in Nashville, our animal control department won’t adopt them out if they get surrendered or picked up as strays – they euthanize. The other main shelter in our area, the Humane Association, won’t accept them either. 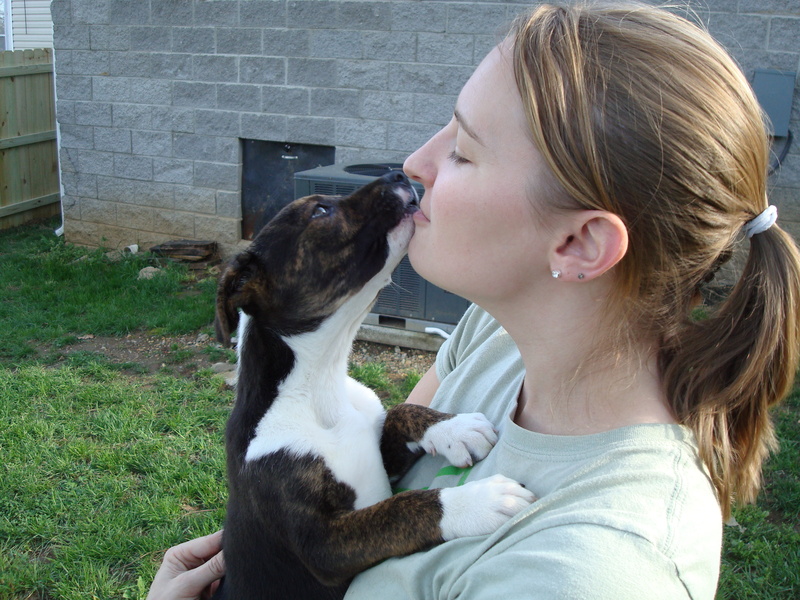 Therefore, our area relies heavily on rescue groups when dealing with unwanted pit bulls. When we decided we were ready to add another member to our little pack, it was without question that it would be another pit bull. However, we decided that more than wanting to own another dog, we wanted to help another dog. …and while we were at it, why not attempt to open up a few closed minds along the way? Welcome to our foster journey! Just found your blog – it is awesome that you’re helping to save this most misunderstood breed. I never wanted a pittie until I fostered one and now they are my favorite breed of dog! I agree – they are truly amazing dogs! Our hope is that we can help just one person realize that through our fostering and blogging efforts. Thanks for reading! After reading all the sad stories about abused animals it is heartwarming to read your blog (and blogs like it) and know that there are still good people in the world and that they love dogs as much as I do. Being a foster is hard work but rewarding, especially when the dogs you care for are considered monsters by so many of the general public, we know who the real monsters are. I just happened to stumble across your blog and wanted to say thank you for all you do! It can be tough being a foster but also very rewarding. What a GREAT title for your blog…had to follow!!! !